The Silver & Black aren’t in the clear yet, but there was a collective sigh of relief after the last home stand. Well, it’s been a heck of a week. The Spurs closed out their home stand going 6-0, taking an essential overtime win against the formidable Utah Jazz. Then they got on a plane, headed to Milwaukee and dropped their road game — which boiled down to the 25 fast break points the Bucks got and the 41 point 3rd quarter allowed by the Silver & Black. The Spurs are in Washington Tuesday night before heading back. It’s possible the Spurs can continue their impressive home winning. With LaMarcus Aldridge consistently outshining the NBA’s most formidable bigs, the Spurs’ playoff picture is slowly coming into focus. Head Coach Gregg Popovich has made lemonade in the wake of his MVP candidate playing only 9 games this season. Other than asking why he didn’t call for a timeout in Milwaukee, there isn’t much to question. But question we must, that’s what In the Bonus is all about. Today, PtR contributors Jesus Gomez, Mark Barrington, Bruno Passos, Marilyn Dubinski, and editor-in-chief J.R. Wilco weigh in on Pop’s no call, his odds on being named Coach of the year, the remaining Spurs games, the ones that got away, and whether or not anyone can stop LaMarcus Aldridge. Spurs swept a six-game home stand recently. They have four more home games left, against the Rockets, Thunder, Blazers and Kings. How many of those can we expect them to win? Jesus Gomez: I think we are all penciling in a win against the Kings. The Thunder have a losing record on the road, but will be rested. I think OKC will take that one. I expect the Rockets to have clinched the first seed by April 1, so I think they might not care about the win as much as the Spurs. Finally, if the Spurs need the game against the Pelicans for seeding purposes, I expect them to get it, unlike what happened in 2015. So I’m going with 3-1. Mark Barrington: All of them? Bruno Passos: A healthy-ish Rockets team should still be the prohibitive favorite, but I’d pick them to beat the other three at home if they continue their high level of play. Marilyn Dubinski: Three seems like a perfectly reasonable request. With the way the Spurs have performed at home (for the most part) I see no reason why they can’t beat the Thunder, Blazers and of course the Kings. There’s no telling what will happen with that Rockets game or who will even play in that one (it’s entirely possible they could have the top seed secured by then and start resting), but a win is definitely the preference for the Spurs’ sake. J.R. Wilco: If the Rockets have clinched by the time they come to town, then the Blazers game is the one I’d worry about. As long as the team is dialed in, and they have been when playing at home, then I’d expect them to take OKC, SAC and a skeleton crew from HOU. The Spurs could use an extra win or two right about now. Which winnable game that they dropped comes to mind as the most painful missed opportunity to pad their record? Jesus Gomez: The recent losses are obviously still on my mind. Those were painful. But one L that stands out to me is the one that came against the Mavericks back in December, on Kawhi’s first game of the season. Despite only missing Slowmo, they couldn’t beat a Dallas team that was without Dennis Smith Jr. They even went into the final quarter ahead, but couldn’t hold on, as Leonard sat with a minutes limit. That was a bad loss. Mark Barrington: Maybe it’s just recency bias, but the Spurs had a shot against the Bucks, but they gave up too many easy transition points. But there have been a ton of heartbreakingly close losses this year. When you only have one solid option on offense, it’s kind of hard to make that work in a end of game situation. The defense knows exactly where to go. Bruno Passos: Recent losses to the Bucks, Pelicans, Jazz, and Lakers all come to mind, but those are going to happen when you’re missing your usual closer and running out different end-game lineups every time. The Jazz and Pelicans ones sting the most right now, given the teams’ jostling for position and the various tie-breaker scenarios in play. Marilyn Dubinski: The Bucks game immediately comes to mind, but those three last-second losses to the Jazz and Nuggets during the Rodeo Road Trip as well as their loss at home to the Pelicans upon returning keep looming large for tie-breaker reasons and the fourth quarter flame-outs. The Spurs could have performed better and won in Milwaukee, and no doubt they needed the win, but it was that bad stretch in February that really put them on the fritz and now has them digging back out. Wilco: The one that sticks in my craw is the first ugly loss of the season: up by 9 with less than 7 minutes left in the fourth playing the Pacers in Indianapolis on a Sunday in late-October. It was the initial in-game action that let us know how much this year’s defense might struggle. They gave up 24 points in just over six minutes, and the team was halfway into their first 4-game losing streak of the season. Yes, they’ve had two of those in 2017-18 … I can’t believe I just typed that. Ugh. Gregg Popovich seems well on his way to leading his team to a top-3 finish in defensive rating and the playoffs without Kawhi Leonard. Is he a contender for NBA Coach of the Year? Gomez: I don’t think he’s a top-three contender, no. It’s not a knock on the work he’s done this year but a testament to how good others have been. Mike D’Antoni, Dwane Casey, Terry Stotts and even our old friend Brett Brown deserve it more than Pop this season, in my eyes. Barrington: He should be, but he won’t be. It will probably go to D’Antoni, deservedly so. Passos: He should be in the running almost every year, but I’m happy to see other coaches get credit for working with less (Doc Rivers comes to mind) or for making fundamental changes that have put their team on a new level (Dwayne Casey or Mike D’Antoni, maybe). My vote would probably go to Casey, although it’ll be important for Toronto to not continue to slip in these final weeks. Dubinski: As deserving as Pop would be for getting this rag-tag team of youngsters to the playoffs in an extremely competitive conference — and frankly patching things up with LaMarcus Aldridge should be COY worthy enough — it’s just hard to see a team that still underwhelmed relative to expectations, regardless of the circumstances, getting that much love when there are other worthy candidates out there. Wilco: He’s not a contender, but that doesn’t mean this hasn’t been one of his more impressive campaigns. The defense is impressive; getting Aldridge to play like a moderately-well-off man’s Tim Duncan is crazy; and navigating through a season where the San Antonio locker room has had more leaks than it has in the previous 10 years combined, certifiably insane. Let’s talk about the last play of the Bucks game. Murray pulled down a rebound with nine seconds left and the Spurs down by three and Pop opted not to call a timeout. Your take on the decision? Gomez: I think Pop made the right decision by not calling the timeout after the rebound. He also signaled Murray to push the pace and attack to either get a quick two or, if the Bucks made the mistake of rotating, a drive and kick for a three. Dejounte clearly didn’t get the instructions, though. It happens. The execution was bad, but I liked the original decision. Barrington: With an experienced team, you go without a timeout and press your advantage before the other team has a chance to set up their defense. Every team prepares for this situation and knows how to handle this kind of situation. With Dejounte at point guard, maybe you need a time out? Captain Hindsight told me a stoppage would have helped, and I’ve never known him to be wrong. Passos: If any other Spurs ball-handler has the ball in that situation, you let them run with it and work with what they’ve got. Dejounte? You absolutely call a timeout. People may make the case for him needing to learn in the moment, but the win is far more important right now. Dubinski: I think initially Pop wanted him to go for a quick two, but when that didn’t materialize he should have called a timeout. I’d understand the decision if the ball were in Tony Parker or Manu Ginobili’s hands (or even Patty Mills), but that was a lot to thrown on DJ’s inexperienced shoulders in those ten seconds. Still, kudos on him for taking full responsibility. The kid has a very promising future once he figures these things out. Wilco: This conversation is giving me flashbacks from 2015. Opponents keep using single coverage to guard LaMarcus and he continues to score almost at will. Is there a big man that can contain LMA in the final games or will he continue to carry the offense? 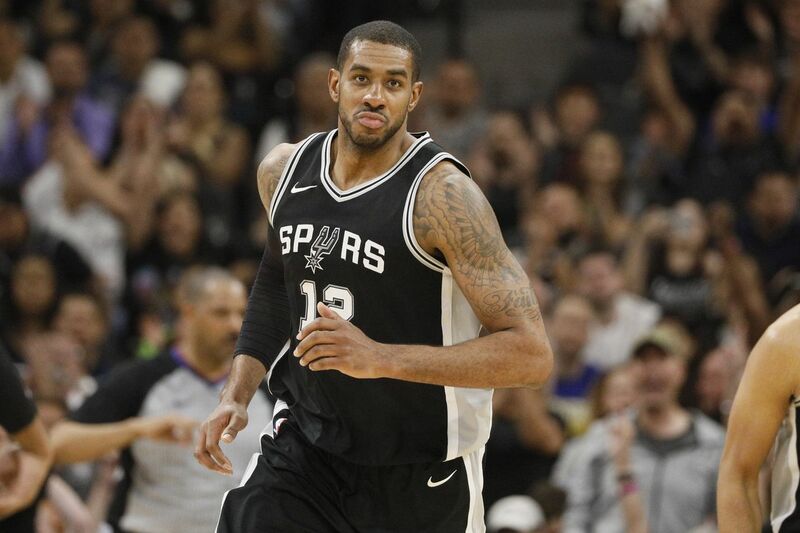 Gomez: Let’s hope no one is able to handle him one-on-one, because the Spurs offense won’t be able to survive without Aldridge dominating. As for who might be able to hold his own against this version of LA in the next couple of weeks, Steven Adams might have a shot. Barrington: He has to. It’s pretty much a given that Kawhi isn’t coming back this year, and the Spur have no other go-to option. Rudy Gay can carry some of the load, but he can’t play the huge minutes that LaMarcus is clocking. Passos: Against guys that are around his height or taller, Aldridge is near unstoppable. He knows how to go into the body of the longer, lankier types (like Davis and Gobert), and he can shoot over or get around everyone else. The issue still might be against the smaller, stockier guys, who get away with a bit more body contact and use their lower center of gravity to keep him from getting deeper position. Draymond Green is one example, but I can see the Rockets having similar success with P.J. Tucker. Dubinski: If Rudy Gobert and Anthony Davis can’t contain him in his current form, no one can. When he’s as hot as he has been in recent weeks and is beating those double-teams, then the opponents’ approach seems to be to let him do his thing and just keep his supporting cast at bay, which isn’t a bad idea especially on the road where they rarely show up. When the role players do show up, then they can’t afford to double-team him anyway. Wilco: Thing is, this isn’t even LaMarcus’ final form. Seriously though, no one has been able to slow him this year (not even last year’s kryptonite, Draymond Green) so I think it’s gonna need to be double-team-or-live-with-it. Do you have a question or comment you’d like posed to the roundtable, please post it in the comments section.